Friday before last I spent a delightful afternoon at the Department of Repair. This may sound ominously like something out of an Aldous Huxley or Karel Capek novel but is actually an exhibition at the Camberwell College of Arts, which “explores (re)making through fixing, repair and mending”*. A series of workshops accompanies the exhibition. 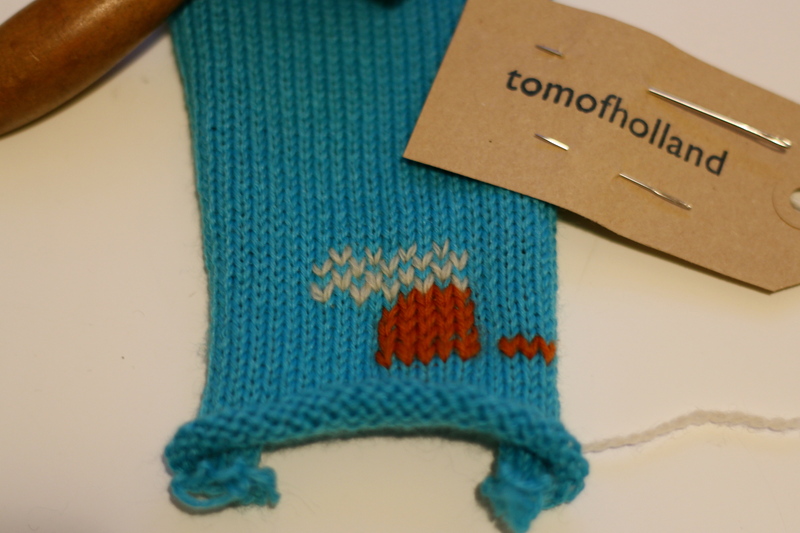 The session I attended was run by Tom of Holland, an absolute darning legend. I have been an admirer of Tom’s work for a number of years so although my mother taught me to darn decades ago, I was eager to go along to glean more. To call Tom a darning expert seriously underestimates his expertise and wisdom. Yes, this softly spoken Dutchman teaches darning techniques, from Swiss darning (for reinforcing worn patches) to classic stocking darning (for repairing clothes after moths have done their worst). 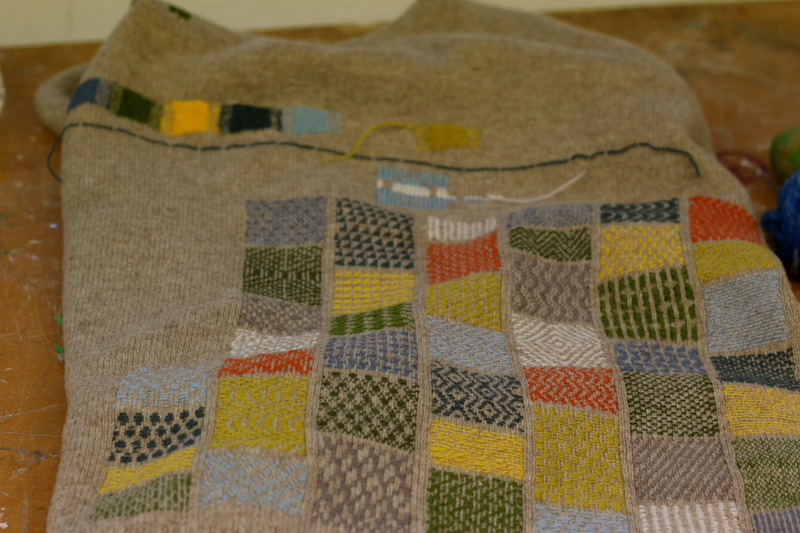 However, Tom shares much more than his technical knowledge; he actively celebrates darning, not just as a way of extending a garment’s life but also as a way of enriching clothes. In an age of fast fashion, with textiles bought in haste and quickly dispatched to charity shops or landfill, he uses a skill that anyone can learn to re-imagine garments and make them better than the original. Samples of his handiwork included socks and gloves that have been darned to within an inch of their life. Tom doesn’t believe that darns are anything to be embarrassed about. There is no shame in wearing clothes that have been repaired so rather than hide darns by painstakingly matching colours, he strongly advocates “visible mending”. Make a feature of the repair; celebrate it as part of the garment’s fabric and journey! Another sample piece illustrated this philosophy perfectly. After rescuing a classic crew neck sweater from a charity shop, Tom realised it wasn’t really working for him anymore. Rather than put it back in a charity bag, he transformed it into an interesting garment with the help of gorgeous Appleton crewel wool and a technique known as damask darning. The result is a unique, interesting sweater, not garish or over-the-top, but one that looks as if it might have been inspired by Portuguese tiles or international maritime flags. 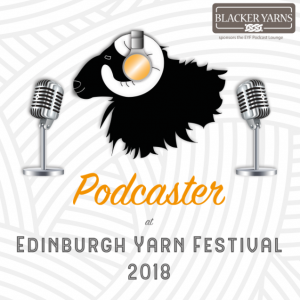 Apart from learning different darning techniques, including how to rescue knitwear with swiss darning before it wears through, I was inspired by meeting others who delight in the fun and creativity of remaking rather than viewing repairs as purgatory or something shameful. A joyful, playful spirit of remaking and re-imagining runs through the whole of the exhibition, from the artefacts on the walls – both objects repaired and repair tools – to the way the exhibition has been devised and developed. Bridget Harvey, one of the PhD students curating the space, explained how a zero-waste philosophy made her and her colleagues more inventive when planning and constructing the exhibition. They looked at every aspect of running an exhibition from a new perspective. For example, they sourced materials from waste streams and assembled the displays in a way that would allow as much as possible to be reused afterwards. They also re-imagined traditional exhibition signage to minimise plastic waste and devised ways to produce an exhibition book from leftovers from the college’s print room. There certainly are times when limited funds mean we have no choice but to patch up items that are only really fit for the scrapheap. In many cases, however, mending is the most sensible solution. As humans are innately creative and imaginative beings, repairing and remaking can also be a fun solution, as the exhibition and workshop illustrated in a thought-provoking but playful way. 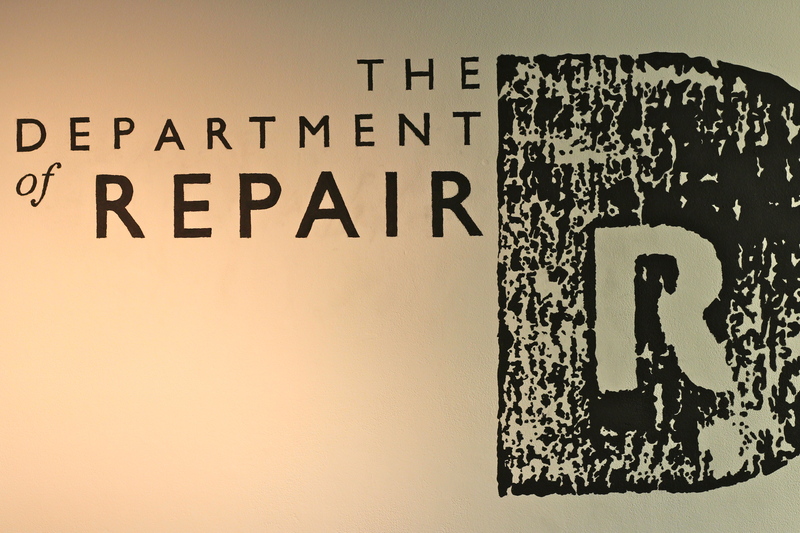 Therefore, despite its ominous name, the Department of Repair actually represents the polar opposite of the controlled, robotic society of Huxley’s Brave New World or Capek’s R.U.R.! * Description taken from Department of Repair, which runs till 20 February 2015 at Camberwell Space, Camberwell College of Arts in London. ** If you want to learn to darn, check out Tom of Holland’s workshops & events or follow him @tomofholland. That sounds like a fabulous workshop. A teacher-friend of mine recently told me he was planning a “repair cafe” as a fundraiser for his school. It’s a brilliant idea and I think (hope) we’ll see more of these types of workshops as people begin to realize that we live on a finite planet. Why pay good money for all this stuff just to throw it away (assuming there’s an “away”)? I was proud of myself the other day because I mended a pair of my underwear and one of my daughter’s t-shirts she needs for her martial arts uniform 🙂 It was a little thing I did, but I felt so satisfied after I had finished.